Guarded Key detects when iCloud is configured on your computer running Mac OS X and automatically enables iCloud synchronization. When you create Guarded Key database and sign in for the first time, the app uploads your database to iCloud and all subsequent updates are automatically synchronized between computer/mobile device and the cloud. Guarded Key will be using your local database as a primary source of data, so if you are not online or cloud servers are not accessible, you will still have access to all your information. 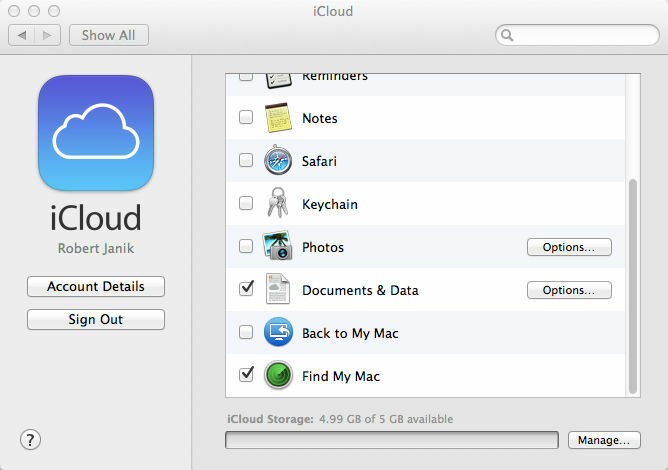 If you don't have iCloud configured on your computer yet, you have to follow the steps described here. From system menu open "System Preferences" and select iCloud. Setup an account using your Apple ID and password. Set check box "Documents & Data" to "checked". This is the only option that must be enabled to make Guarded Key synchronize data. Other options can be set based on your preferences and needs for other content to be saved in iCloud. Start Guarded Key, open menu and select "Tools -> Settings". Verify that "Cloud Service" radio button is set to "Apple iCloud". Start Guarded Key and sign in. The app will detect that iCloud is configured on your computer and it will display an alert "iCloud Configured" at the top of the Guarded Key window. This alert will disappear after a few seconds and a new alert "iCloud Available" will show up. 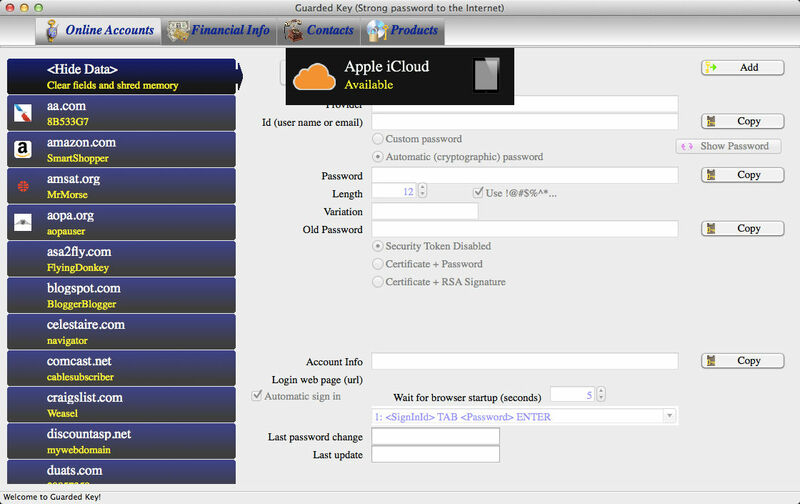 It means that Guarded Key was able to contact Apple iCloud server and real time iCloud synchronization is now possible. 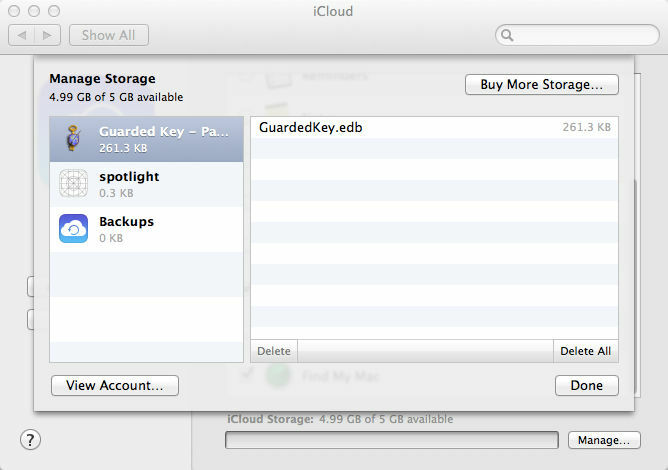 You can verify that Guarded Key uploaded the database to iCloud by looking into the Mac OS X dialog window Manage Storage. From system menu open "System Preferences", select iCloud and click on "Manage" button. You will see Guarded Key app and it's logo. When you click on Guarded Key app, it will show list of files in the cloud. In this case there will be your database, GuardedKey.edb file. Great! Now you can setup iCloud on iPhone/iPod/iPad to enable data synchronization between Mac and your mobile devices. Well done! Your Guarded Key is ready to use iCloud.